Three years ago I spent a month as a volunteer for Wildlife ACT on uMkhuze Game Reserve in KwaZulu-Natal, South Africa. It was a month I will always treasure for a variety of reasons. 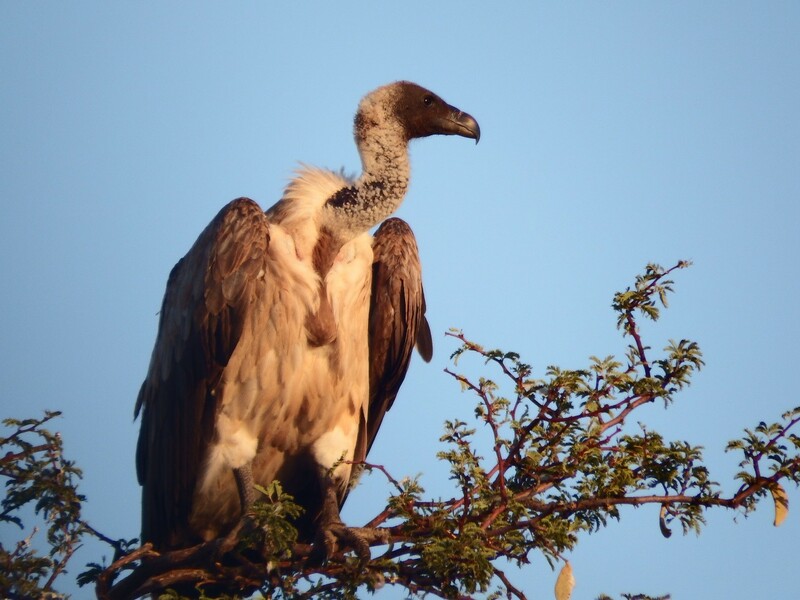 It was my first experience of Africa, and my first encounter with wild vultures. The thrill of going on safari is thinking about what you might see. Would I find a pack of African wild dogs? Would I spot the elusive leopard? What about the critically endangered black rhino? These sightings are far from guaranteed, and the potential to fail makes the successes all the sweeter. But there are other species that you assume you’ll see from the minute you book your trip. Zebra, wildebeest, vultures. Don’t get me wrong, you’re hopping out of your seat with the excitement of finally seeing these species in their natural habitat. But you’ve watched a lot of Animal Planet in your time and you feel you’d be in hard luck not to check these species off your list. I saw quite a few vultures over the course of that month, but they weren’t nearly as ubiquitous as I anticipated. What about all those documentaries I’d watched over the years? We’ve all seen that typical savannah sequence countless times. A predator kills its prey and it seems that almost instantly the swarms of powerful wings and hooked beaks descend to see what they can grab for themselves. You watch how quickly they arrive on the carcass and think the skies must be full of these impressive birds. How else would they reach the kill so quickly? White-backed vulture (Gyps africanus), Kuruman River Reserve, South Africa. Come on, they’re at least sort of cute, right? (Photo by Holly English). BirdLife International’s Love Vultures campaign was a rare success story for vultures, which aimed to raise £50,000 (€62,545) for vulture conservation in Africa and surpassed its target comfortably, reaching £69,313 (€86,703) at its close.3 This money will fund a ten year plan to tackle the poisoning epidemic, influence policy and create Vulture Safe Zones.1 But promoting and maintaining awareness and public interest is also a crucial part of this plan. 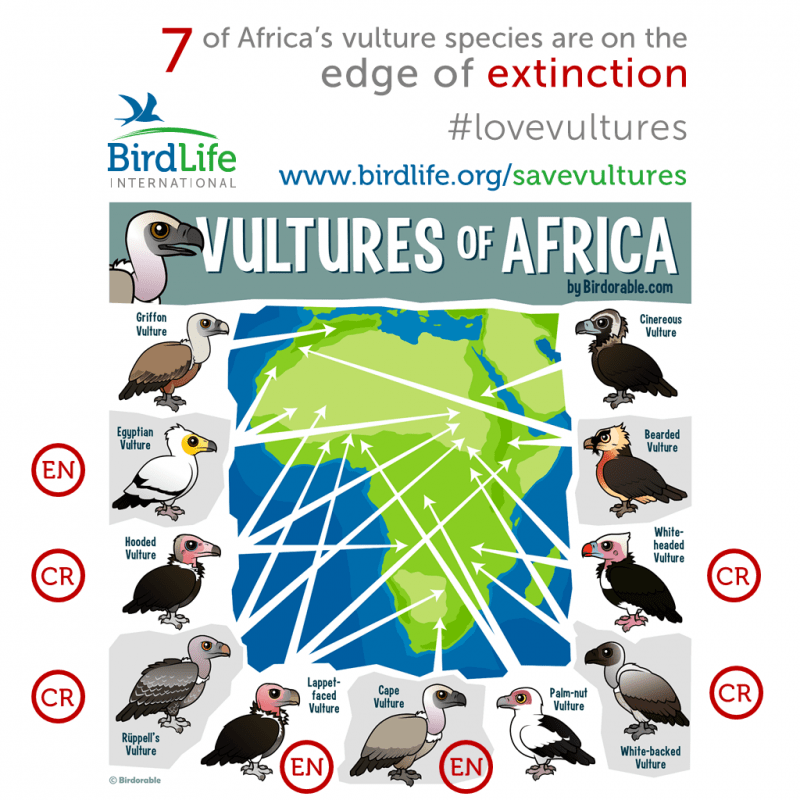 An infographic on the vultures of Africa produced for the Love Vultures campaign. CR – critically endangered, EN – endangered (Graphic by Birdorable). In January of this year I returned to South Africa, this time for a much longer stay on the opposite side of the country. For now I am privileged to call the Kuruman River Reserve in the Kalahari desert my home. A few days before writing this piece I was lying in the sun when all at once 14 vultures appeared in the sky seemingly out of nowhere. I watched them circling for some time before they split off and disappeared into an abyss of blue sky once more. Presumably, they were white-backed vultures (Gyps africanus) which I have seen on this reserve before, and which I saw in uMkhuze when I came to South Africa first. The same species, but in those three short years since I first encountered them they have been uplisted from Endangered to Critically Endangered on the IUCN Red List. With this in mind, watching those 14 elegant, soaring birds disappear from sight one by one became uncomfortably poignant. As far as I’m concerned, nothing is more graceful in flight than a vulture. We have punished them simply because they are scavengers, because we decided they are ugly. Anyone who can’t abide the appearance of a vulture on the ground, needs to step back and admire them in the air at least once before they cast their judgement. But be warned, it’s not as easy a sight to find as it used to be. Vulture conservation has reached crisis point. The issues facing these birds go beyond persecution. If we are to reverse these declines and see vulture populations rising again, we need to do more than accept their important niche in ecosystems. We need to show them some of the affection and admiration we shower upon the cute and cuddly animals. It’s easy to find someone who loves pandas or tigers, and find public support for their conservation campaigns. That’s not to take from these campaigns in the slightest, but it’s time to support the less conventionally attractive animals and rally around them too. It’s time to love vultures. Holly is a zoology graduate from Trinity College Dublin. She is currently based in South Africa, working with the Kalahari Molerat Project in association with the University of Cambridge. She has past experience with Marine Dimensions, Operation Wallacea, the Herpetological Society of Ireland, Mammals in a Sustainable Environment (MISE) and Wildlife ACT. She is primarily interested in conservation and behavioural ecology. Nice article, Holly. The international push to highlight the issues with vultures is one that pleases me. BirdLife South Africa even posted a press release last year about a NEW BIRD species named the ‘tuluver’, which I was unsure of at first. However, the eventual reveal had a powerful message, which will stay with me forever. My girlfriend, Morgan Pfeiffer, is studying Cape Vultures at the University of KwaZulu-Natal (same uni as Cormac). Going to the vulture colonies (Cape Vultures are a communal cliff-nesting species) has been one of the most amazing experiences one could hope for. I am aiming to visit a colony with Cormac in the next few months to monitor nest success. I’ve been fortunate to see pretty much all southern African vulture species; the exception being Rüppell’s vulture, which is extremely uncommon. Which other species did you see? Well done, Holly. Thank you for your unique perspective and for citing some good research on this incredible, important and often misunderstood member of the natural world. Certainly a vital component of our entire health as a world community, and one well worth safeguarding!